The Last Days of Burton Holmes, Inc.
Burton Holmes was a major force in teaching us about travel and distant places. He started companies to manage his lecture tours, to publish his books, and to produce and distribute his films. By the early years of the 20th century he was a well-known figure, and his fame continued to grow; his businesses grew in similar fashion. By the late 1970's, however Burton Holmes, Incorporated, was changing into a company specializing in the production and sales of holographic images. How did this happen? By the time of Holmes' death in 1958, the market for travel lectures was already changing. Thayer Soule, in his book On the Road with Travelogues: 1935-1995: A 60 Year Romp. [hereafter, Soule], tells us that with Holmes gone, it became more and more difficult to book lecture halls and sell tickets. Holmes had ceased presenting the shows after his stroke in 1951, calling on Soule, Robert Mallett, and other lecturers in the Holmes' company stable to make new films and keep the lecture halls filled. In the mid-1950's the Burton Holmes Travelogues company was reorganized as Burton Holmes, Inc. Soule says [p. 123] that the "stock was split between [Burton and Margaret] Holmes, Walter [Everest], Bob Mallett, and [himself]." In late 1958, with BH dead, Soule resigned from the company and went out on his own. He retained the rights to the last four films he had made for BHI, and now did his own bookings. As an independent creator and presenter, with lower operating costs, he was able to continue giving travel lectures and shows until his retirement in 1995. But at BHI, with Holmes gone, the remaining management had a long-term problem. They continued producing travel films and lectures, presented by Mallet, Hollingsworth, and others in the Holmes circuit. Additionally, they were able to make some money leasing rights to Holmes' films and photographs. But they had rent to cover and staff to pay, and no way to develop the large cash flow that the Travelogue company had depended on. With the start of the 70's came a major cash crunch for the company. Bob Hollingsworth, under the direction of the Board, compiled a dossier on the financial status and prospects for BHI. They were not good. Hollingsworth proposed selling Topside, and using the money to keep the company going, pay some back debts, and revitalize the lecture and film series. BHI sold Topside, but then went off in a totally unexpected direction. Much of what we've been able to piece together about the last years of BHI comes from the recollections of John Robertson, who started working there part-time, in 1976, while a college student. During the summers he worked for BHI full-time, and this went on for several years. He writes [private communication]: "By 1970, BHI was essentially being run by two men, Robert Mallett and Robert Hollingsworth. Mallett and Hollingsworth realized they did not have the funds to create films and run lecture series in the style of Burton Holmes Travelogues. They decided to approach the problem as BH would have done: find, develop, and/or create a new way of recording and presenting images that would become a useful way to present three-dimensional representations of people, or distant lands, or anything. They decided to go into Holography, then a hot topic with great expectations." Regarding Bob Hollingsworth, Soule says, ibid and p.60: "Working with Bob was Robert Hollingsworth, a young fellow, a huge teddy-bear of a guy, who would do anything for anybody, always with a smile. He worked with me in 1953 on "Charm of the South" and "Hawaii," and later did a film or two with Bob Mallett. The pictures weren't that great, but Mallett brought them to life with his personality and masterful narration. Hollingsworth became the general handyman of the organization, a tireless, lovable gofer, invaluable in countless ways. He married and had a couple of kids, but his heart couldn't support his size and weight, or his outpouring of energy. He died very young, a loss to all of us." Robertson credits Holmes himself with discovering Hollingsworth: "Bob Hollingsworth was sixteen, and still in high school, when he met Holmes. He and other boys in the neighborhood used to play on the grounds at Topside; every once in a while Mrs. Holmes would let them swim in the pool, but most of the time they would enter through a hole in the fence and swim at night without permission. Bob was looking for a way to make pocket money by doing odd jobs for his neighbors. He persuaded Holmes to let him plant the palms that Holmes had purchased to line the drive that lead up the hill to Topside. Holmes was impressed that Hollingsworth was such a go-getter for one so young, and took him under his wing." "Bob Hollingsworth was an incredibly creative person; Bob Mallett was the businessman of the company. Hollingsworth was a huge man, some 6'3" or 4" in height and well over 350 lbs for most of his life, but he was constantly in motion; for a man of his size he was quite nimble and he had tremendously large and strong hands. He had boundless creative energy and would routinely be working on or directing multiple projects simultaneously, often on impossible deadlines. He smoked like a chimney, two packs per day of the most noxious, high-nicotine cigarettes he could find. When busy editing film or creating a new holographic image in one area, he would also be supervising other projects or contributing to a meeting going on in the next room. He could be seen dashing from room to room, and when he went barreling down the hallway only a Sumo wrestler would have dared stand in his way. Often he would simultaneously be burning cigarettes in four different ashtrays within the office. "When Mallett and Hollingsworth got into Holography, they did it in a big way. The goal was to be able to create holographic movies in full color. In the late 1970's, reproducible holograms were only available as still pictures, in a single color only. This was just a starting point for BHI. They opened a retail store, the Odyssey Image Center, in the first floor of the BHI building, as a sales outlet for their products and for other holographer's images. Robertson remembers tearing out the walls, and doing the painting and carpentry to turn three small stores into one larger space for Odyssey. A visit to the Odyssey Image Center at the end of 1977 inspired Gary Zellerbach to open the Holos Gallery, in the Haight Street area of San Francisco, in 1979. Holos Gallery became the most famous, and longest-lasting, place to find holograms of all kinds. It bought inexpensive holograms from, and sold them to, Hollingsworth and Mallett; but its real intention was to display and sell high-end holographic art of the kind just then being developed by holographers, artists, and optical scientists all over the U.S.
"There had been experiments with dichromate emulsions for better color rendering, but they were not then currently usable. Hollingsworth invented a color inversion table that was used to simulate "spot" colors in holograms. He worked extensively with Richard Rallison, holographer of the The Dichromate Co. in Salt Lake City, Utah. Others who contributed to work in this field include Michael Foster, of Electric Umbrella, who found a way to do dichromate "glass sandwich" holograms in quantity so that they were affordable as premium items, and David Schmidt of the Museum School of Holography in San Francisco. Schmidt also ran the Multiplex Company in SF and Odyssey was for some items their biggest reseller." At some point in this period Schmidt, Mallett, and Hollingsworth set up a separate company, Hololabs, to develop and market new holograms. "Schmidt worked with Dr. Lloyd Cross, inventor of the multiplex holographic process, which involves laser translation of specially generated motion picture film onto a holographic medium that had originally been developed for spectrometry testing. Robertson: "Cross was a brilliant scientist but he was a bit eccentric. He developed the theory of how it would work, and Schmidt built the actual processing equipment. Hollingsworth designed and built a custom studio, complete with elevated, motorized turntable, synchronized to a Mitchell 35mm movie camera, for producing the movie film that originally captured the images. This studio was built in an 8' by 14' room off the upstairs hallway in the BHI Building. For a 3-D effect that would be presented well on the spectrometry medium, Cross, Schmidt and Hollingsworth put their heads together and discovered that a specific fraction of a degree of rotation per frame of film was required. The turntable was five feet across and synchronized to rotate at the exact correct speed while the camera was running." "Hollingsworth and Mallett sponsored a conference "Holography Summit '79," held at the BHI offices. This brought together dozens of researchers in the field who had not previously met each other. Wonderful synergies and new developments came from this. 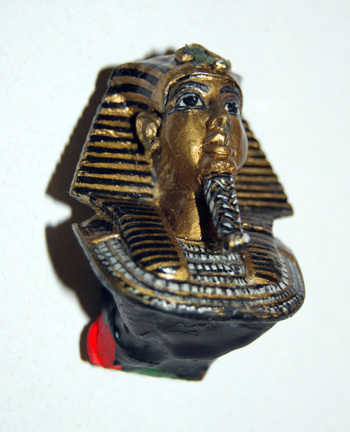 "Hollingsworth sculpted a death mask of King Tutankhamen, which he made into holographic reproductions that were sold all over the world, and were probably the last widely available BHI product on the market. The mask had had to be painted and toned with single-bristle brushes; fortunately BH himself had taught Bob how to do this, having learned it from the craftspeople who had done it for the glass slides originally used in the lecture series. Some of the same magnifying equipment that had been used to hand-color glass slides was used to paint the Tutankhamen image. The original model, missing for decades, was found in a storage unit belonging to Dave Schmidt after his death in September 2007. Along with it was a similar bust of Elvis. Schmidt was partner with Hollingsworth and Mallett in Hololabs, and did the photographic and optical work for their originals. By permission, Lorill Hirschberger. Photograph by Michael Ward. Robertson: "Bob Hollingsworth was married and they had two daughters. Though his wife and daughters lived in the San Fernando Valley, Hollingsworth was a workaholic and took an apartment on Doheny Drive to be near the BHI offices; but he still visited the Valley regularly to stay in touch with his daughters. "While Hollingsworth was trying to balance his creativity, his family, and his paycheck, Bob Mallett had his own problems. While he was supposed to be the business side of the business, he was typically at the offices two weeks or less of each month. Mallett rented one of several detached cottages on Willoughby Street, between Sunset and Bronson, just around the corner from the BHI offices; but he commuted from San Francisco, where he spent a great deal of time taking care of his mother. Mrs. Mallett was elderly and frail, and essentially confined to her suite at the El Drisco Hotel." (There is a belief, one that will someday be verified, that this hotel had been built for the Mallett family in 1903 and was still in the family in the early 1980's; it continues today as the Hotel Drisco, a luxury boutique hotel located in Pacific Heights, a very ritzy neighborhood of San Francisco. "Mallett came from a prominent Sacramento, California family, and had inherited a good deal of money. This stood him in good stead, as he was often called on to pay BHI's company expenses out of his own pocket. With Mallett preoccupied with his situation in San Francisco, he couldn't spend as much time with BHI as was needed. Hollingsworth had to manage both the creative and business sides, and was stretched too thin. He entered numerous deals which began well, but became increasing drains on his time and the company's finances. "BHI was always short on cash, would have gone under long before this, if it had not had people willing to work with little or no pay, infusions of cash from Mallett, and a landlord who rarely asked for the rent. The Palmer family of Los Angeles had owned many properties, and the BHI offices were in what was at that time called the "Palmer Building." The last member of that family, Mrs. Palmer, had been a friend of Burton Holmes, and for his memory rarely asked BHI to pay the rent that was due. BHI always tried to pay the rent, and when money came in would pay what it could on account; but it never caught up. "BHI had originally occupied both floors of the building, except for three storefronts on the street: the Golden Carrot health food store; Jenson's Forge (wrought iron furniture); and a barber shop. One of the storefronts was rented by Scientology and used as a local center for several years. Eventually the three shops were opened up into one larger storefront, and this became the Odyssey Image Center. However, this was too much space, and undoubtedly too much rent, for BHI. Over time the BHI offices were consolidated onto the second floor; later, they were squeezed into just the back rooms of the second floor. At length Mrs. Palmer died and the building was sold; the new landlord came for the rent and BHI had to leave. They had nowhere to go." Robertson's last project for BHI was at the end of 1980 and the beginning of 1981, but for the next couple of years after that he would visit the offices when he was in town. In 1985 he stopped by for another visit, but the BHI offices were gone. He does not know when they closed down or exactly what happened to their furnishings and archives. BHI never dissolved the California corporation founded in 1958, but simply went inactive. At times it called itself Burton Holmes International, probably during the cash-crunch years when it couldn't keep up its corporation license fees. Hololabs, the separate company with Dave Schmidt, was dissolved in 1986. Hollingsworth, by this time living in Costa Mesa, California, died of heart failure in March, 1989. Mallett died in Newport Beach, California, in September 2000. What both of these gentlemen had been doing in the intervening years is unknown, as is the final destination of the records, scrapbooks, the archvies of BHI. If anyone can help us fill in the record it would be greatly appreciated; contact us, please. In June of 1978, renowned cinematographer Bill Cartwright, aided by Scott Goren and Genoa Caldwell, spent many days inspecting the BHI film Archives, frame by frame, and they created a detailed log of all the films still in BHI's possession. As he put it in a letter to us, "Then in the next four years, the Burton Holmes company and the Archives fell off the radar screen. It is now a lost treasure, and there's not a hint of how such an important collection could be lost. It was too large a collection to casually dispose of, and one could not have been so unaware of its money value, even if they did not realize its historic importance. The real question is, does it still exist, and in what condition and where?" What seems to be the major part of the film archive turned up in storage in Hollywood, in 2004. Is there more to be found? The rest of the film archive? The scrapbooks, the files? Are they lost forever? Maybe they're all just sitting in a storage locker in Pasadena, waiting for us to find them. We can hope. John Robertson says he treasures what he learned at BHI. Bob Hollingsworth had a restless, creative spirit that serves as John's own inspiration in being an independent entrepreneur; it's sometimes a scary thing to contemplate, with five kids to support, but to him it has never been an issueBob Hollingsworth showed it could be done. John can be reached at his company Topside Marketing in the Seattle area. If that name sounds familiar, yes, you're right; its name originally came from the name of Holmes' house in Los Angeles, by way of honoring his legacy. We also have some remembrances from Gregory Wright, who was there for a while in the later years. We'd to add other voices remembering BH and his companies, to help us understand what it was like, how it worked, and how it died. Gary Zellerbach talked with us about his long connection with holography, and how the Burton Holmes projects were the inspiration that caused him to open the Holos Gallery. Update history: This page created 4 May 2004. Latest revision 7 October 2016.